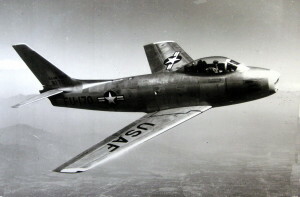 On February 28, 1957, two F-86D Sabre jets from Westover Air Force Base were on a routine training flight when they collided in mid-air over the Quabbin Reservoir in central Massachusetts. One aircraft, piloted by Lieutenant Robert Smyth, (28),went down in a wooded area off Bay Road in Belchertown. Smyth ejected safely, and landed about 1.5 miles from the wreckage. The second aircraft, piloted by Lieutenant John Young, (25), dove down through the ice covered reservoir and sank to the bottom. Young also ejected safely, and came down on a small un-named island in the reservoir. He was rescued a short time later by helicopter. Neither pilot suffered serious injury. The men were assigned to the 337th Fighter Interceptor Squadron based at Westover Field in Chicopee, Mass. Source: Springfield Union, “Jets Collide Over Quabbin; Two Pilots Bail Out Safely”, February 29, 1957, page 1.